Following his own advice and going the extra mile is what has earned Adam this quarter’s We Are Harris award. As a support analyst for HSS’ School Nutrition Solutions (SNS), Adam handles all types of support calls and helps clients work through their issues, from state and federal reimbursement claims and yearly verification processes to inventory, meal planning, and everything in between. And that’s all just before Adam wonders what more he’s able to do. In addition to the regular functions of his role, Adam writes special scripts and programs custom code, not only in situations where clients have unique requests, but also for HSS’ internal SNS needs. Why? Because he can. That’s what he means by looking for those extra ways we’re each able to help. But Adam doesn’t just “speak in code.” Having been with HSS for eight years and with an HSS-acquired company for three years before that, Adam has a knack for talking to and working with people. 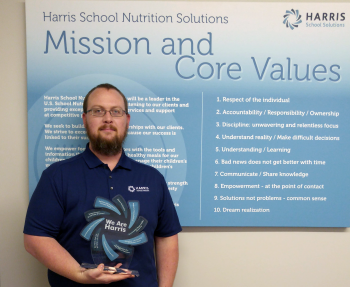 And together, all of us here at HSS thank Adam for his dedication and congratulate him for earning the well-deserved recognition of the We Are Harris award. Want Adam and his teammates to support you? Click here to contact your friendly Harris School Solutions representative today!